Q: What precautions should I take to avoid stomach troubles in Tanzania? A: Cleanliness is very important when handling all food. Wash your hands as often as possible with soap, especially before meals. Where sanitation facilities are limited or rudimentary, alcohol hand cleaning gel can be very effective. Bring a few travel-sized bottles from home. They’re very easy to carry anywhere. Although Tanzanian street food looks and smells tasty, avoid it if you have a sensitive stomach. Eat it only if it’s been cooked piping hot in front of you and served on clean plates. Food that has been recently prepared, cooked and served piping hot is generally safe to eat, as is fruit (e.g. bananas and oranges) that you can peel yourself. Dairy products that have been pasteurised such as yoghurt, cheese and milk are generally safe (and tasty!) to eat. Only buy water in bottles that are served in factory-produced cans or bottles with intact seals. Carbonated drinks, fruit drinks and pasteurised drinks in this condition are generally safe to drink. Don’t drink anything where you suspect the seal has been tampered with. Tea and coffee made with boiling water and served piping hot are also generally safe to drink. If you don’t have bottled water, you can kill bacteria and other nasties by bringing the water to a rolling boil. Don’t drink the tap water or clean your teeth with it. Q: What vaccinations are recommended for Tanzania? A: At least two months before your trip please visit your doctor or specialist travel health professional to ensure that your vaccinations are up to date. These vaccines should include measles-mumps-rubella (MMR) vaccine, diphtheria-tetanus-pertussis (Tdap) vaccine and polio vaccine. Vaccinations against hepatitis A + B, typhoid and rabies are also recommended. If you’re travelling to Zanzibar you’ll need to have a yellow fever vaccination. Tanzania in general does not require a yellow fever vaccination, but if you have a connecting flight within Africa, you’ll need a yellow fever certificate to enter Tanzania. Also consider malaria prophylaxis. If you need emergency medical assistance during your trip, dial 112 and ask for an ambulance. You should contact your insurance/medical assistance company promptly if you are referred to a medical facility for treatment. A: All our treks and packaged trips that aren’t safaris include airport transfers to and from the airport. For our safaris, which start and end in Moshi, you’ll need to book the airport transfers for 40 USD per one way. Please provide us with your flight details (arrival time + flight number) via info@vivaafricatours.com. Q: What are the visa requirements for Tanzania? A: It’s best to check your visa requirements with Tanzania's embassy in your home country, or with your foreign office department. Visa rules differ depending on where you’re from. The Tanzanian embassy website will always have the latest information about requirements and costs, and you’ll be able to download the correct forms. Q: Do you help with visas? A: Sorry, we can’t help you with the visa application process but you can apply easily through the Tanzanian embassy in your home country. Q: What is the local currency in Tanzania? A: Tanzania's currency is the Tanzanian shilling (TZS). It’s called the shilingi in Swahili One US Dollar is worth 2241 TZS (September 2017). Coins: 500 TZS, 200 TZS, 100 TZS and 50 TZS. Q: What documents do I need to carry with me? A: We’ve prepared a complete packing list, which will give you an overview of what travel documents you’ll need to carry with you. We recommend you make copies of your documents (you can also take pictures with your smartphone and store them in the cloud online so that you can access them anywhere). Don’t forget to carry two extra passport photos with you and the contact details of your embassy. Q: What kind of adapter do I need to charge my electronic devises? A: Tanzania has two type of plugs Type G (British) and Type D (Old British). Type G is the more common plug, but there are still places that use Type G. We recommend to bring an adapter that covers both plugs. Q: Will I have mobile coverage? A: We love Tanzania but we have to admit our telecommunication coverage isn’t all that great and it’s a nice surprise if our own mobiles work everywhere. Your best bet is to contact your phone provider before you travel to check for global roaming and prices. Alternatively, you can easily purchase a local sim card in Moshi, but make sure that your phone is unlocked or it won’t work. A: Yes, internet access is possible. Moshi has a few internet cafés as well as restaurants/bars with wifi access. Most of the hotels offer free wifi. The speed of the internet differs from place to place. Please keep in mind that our infrastructure might not be as up to speed as in your country. Q: What’s the best way to carry money? We recommend a mix of money: credit card and cash in US Dollars. Moshi has plenty of banks, where you can withdraw money with your Visa (preferred) or MasterCard. Since there is a daily withdrawal limit of 1,000,000 Tanzanian shilling (roughly 570 USD) you should carry some US dollars in cash with you. This is especially handy when it comes to paying the remaining 70 % of your tour price. At our Viva Africa Tours' office we accept cash only. For security, keep your cash in different places – in your luggage, and on your body. Keep a backup credit card separate from your main one and keep online cash safe in two different accounts. Always keep your important stuff like passport and credit cards in a money pouch close to your body and/or under your clothes. If you’ve a spare wallet or purse that you don’t mind losing, stick a few low-value notes in and a fake credit card. Q: Can I store excess luggage during my trek or safari? A: Yes, we can store all your items that you won't need on your trek or safari for you, and hand them back safe and sound when you return to Moshi. We’d appreciate that you don’t bring your grand piano with you, though. Q: I am joining a group safari. How can I get in touch with my fellow travellers before the trip? A: We adhere to data privacy best practice so we don’t share the details of your fellow travellers unless they have expressly agreed to it. But we do ask our guests if they are happy with sharing contact details, and if they are, then we share. Half the fun of a trip is making new friends! Q: What is the best route to climb Kilimanjaro? Do I want fantastic views? Do I want a crowd or time to myself? How much time should I take to acclimatise? Marangu: easier climb; can be fast (but don’t forget to acclimatise) so can be a cheaper option; dormitory-style overnights so no camping is needed; less busy because of the limited number of beds on the route. On the downside, it’s an out-and-back route so the scenery has less variety. Machame: popular, tougher climb; very beautiful route; good for acclimatisation so the success rate of reaching the summit is high; camping route for those of you who love camping. Downsides are that it can get busy in high season. Lemosho: a long route so good for acclimatisation; very picturesque; quieter route; beautiful views. Downside is that because it’s a longer route, it’s more expensive. Rongai: the wildest, quietest route; the only route that approaches from the north; drier and less wooded so ideal if you want to climb during the rainy season. Downside, you’ll need an extra day to acclimatise, which will add to the cost. Umbwe: great if you love a challenge as it’s the toughest and steepest route with little chance of acclimatisation, as it’s a quick route; suitable only for experienced high-altitude climbers; an exciting climb on ridges; fantastic views with the mountain to yourself. Downsides – only for the experienced. Western Breach: a tough climb; quiet route; beautiful hiking. Downsides – you’ll need an acclimatisation day, which adds to the cost. Northern Circuit: the newest route; very beautiful; it’s the longest route so best for acclimatisation; a 360 degree route takes you round the mountain for great views; being new, it’s less travelled. The downside is that it’s pricier because it’s a long route. Q: What is the best time to climb Kilimanjaro? A: You can climb Kilimanjaro all year round if you have the right equipment but August to October is the climbing season as it tends to be drier during these months. The disadvantage of this time is that it’s Kilimanjaro’s rush hour. If you want peace and quiet, climb in June. Q: What are the signs of altitude sickness? The symptoms of HAPE can start to appear a few days after arrival at high altitude. Both HAPE and HACE can be fatal if not treated immediately. Q: What happens if someone has to descend because of altitude sickness? A: You’ll always be accompanied by a team of guides and assistant guides. If someone becomes ill, they’ll be escorted safely down the mountain by an assistant guide. You won’t be left on the mountain without a guide! Q: How far do we hike each day? A: On most days, you’ll hike about 10 km (6.2 miles) and this will be at a slow pace so that you can adjust to the elevation. We don’t do route marches! Q: Why do we make the final ascent to Uhuru Peak at midnight? A: Kilimanjaro's final ascent to Uhuru Peak is made at night because of the weather patterns on Kilimanjaro. The midnight trek to the summit is designed to ensure your safety as if you summit during the day, you run the risk of being caught in snow, hail or rainstorms. You’ll also get the most amazing views from the summit with the sun rising in the pink and apricot skies of dawn, and you’ll be well on your way down before the clouds roll in at 10 a.m. sharp. Q: What kind of gear do I need to pack? A: We’ve provided a full packing list, which explains what you need to bring on your climb. Q: Can I rent equipment from Viva Africa Tours? A: We will provide you with most things you’ll need on your hike as we rent or own much of the equipment, but there are some things you’ll need to provide yourself with. Take a look at the packing list and make sure that you bring everything you need. Alternatively, we can recommend places in Moshi from which you can hire anything you can’t bring from home. Q: What will the porters carry and what will I carry on the climb? A: We love our porters. Theyare very special people. They are tough and hardy, and you will be amazed at their resilience. They’ll carry most of your luggage, as well as tents and other camping equipment, cooking gear, rucksacks and picnic tables. Our porters won’t ascend the summit stretch with you; this is the guides’ and assistant guides’ job. All you’ll need to carry is a day pack with your drinking water, rain gear, camera and lunch. Q: Is it possible to buy energy snacks in Tanzania? A: Energy snacks and drinks aren’t common in Tanzania so you should bring a supply with you. Gel energy snacks are extremely useful for summit day. Q: How much should I tip each guide, cook and porter? Q: Do Viva Africa Tours' guides carry first aid kits? A: Yes, our guides carry well-stocked first-aid kits with equipment for cuts, scrapes and blisters: they also carry common over-the-counter medicines, and some emergency supplies. They don’t carry prescription medicines so please bring your own supply. Q: How experienced are the Viva Africa Tours guides? A: Each of our guides has several years of experience on Kilimanjaro. They each need to be licensed by the park authorities, too. Our most experienced guide has climbed Kilimanjaro more than 200 times (18 years’ experience) while our most junior guide has climbed about 50 times (5 years’ experience). Be sure to listen to your guide’s advice while on the mountain and remember to go slowly. Q: How should I physically prepare for my climb? Kilimanjaro is considered by many to be the easiest high mountain to climb. However, the altitude of 5,895 meters (19,340 feet) is still extremely high and it’s essential that you prepare properly to get the best out of your hike, to feel well and healthy every day and to avoid mountain sickness. It’s best if you train for at least two months before your trip – hiking and hill walking at home to strengthen your muscles and test out your kit, and some cardiovascular exercise to strengthen your heart. Also, it is absolutely essential that you research and understand the causes and symptoms of altitude sickness before beginning your adventures. Q: How does Viva Africa Tours choose lodges and tented camps on safari? A: We’ve made it our business to research in depth the lodges and tented camps available for your safari adventure, and we only choose to work with the ones that maintain excellent guest care standards. We’re very confident in our choices and this has been supported by our guest experiences and comments. We work hard to choose the best accommodation for you from our favourite lodges and we do this on the basis of what you want. You might want a luxury experience, or to be up close to the animals, or to have a pool, or all three! Maybe you’re budget-conscious, so we’d choose somewhere that’s still wonderful but suits your budgets. We’re not all millionaires! But we do have a great range of different kinds of lodging, from private luxury tented lodges to adventure camping to mobile camping and beyond. Q: On camping safaris, what equipment does Viva Africa Tours provide? A: We provide camping equipment including tents, sleeping mattresses, tables and chairs. We also provide all cooking equipment for safari. Please see our Safari Packing List for items you should bring with you to Tanzania. If you need to rent equipment such as sleeping bags or other gear, that’s not problem but please let us know in advance. Q: Can I request special diet for safari? Yes, of course. Just because you’re on safari doesn’t mean you can’t eat how you want or need to! We want to make sure all our guests are well fed and watered. We can cater for most dietary requirements, whether they’re medical (Coeliac, food allergies), ethical (vegetarian, vegan) or religious (kosher). We do need advance notice so that we can prepare everything for you, so make sure you tell us beforehand. Q: Do I need to bring a water filter? A: No, we filter the water so you won’t need to bring one. Q: What is a typical menu on a camping safari? We love food and on a safari you’re going to work up an appetite so we’re very focussed on mealtimes to make sure that you’re well-nourished, healthy and happy. You won’t go hungry! On camping safaris, our chef will feed you well with three hearty meals daily (breakfast, packed lunch and dinner). We’ve selected our menus to make sure that you are well nourished and that you enjoy what you eat. We cater for special diets like veggie, vegan or gluten-free (see above), too. Breakfast: Hot drinks such as coffee, tea, porridge and other cereals, fresh fruits prepared carefully, scrambled or fried eggs, sausage, toast, butter, honey and jam. Lunch: A tasty packed lunch which usually includes things like sandwiches and chicken wings, boiled eggs, biscuits and crisps (oops, how did that get in? We love crisps) and well-prepared fruit. Juice to drink and we always have water available. Dinner: Stews, soups or bakes (meat and vegetarian), rice or noodles, carefully-prepared salads and fruits. Tea and coffee. Q: What is Tanzanian food like and should I try some? A: Tanzanian food is hearty, tasty and filling and yes, you should definitely eat like a Tanzanian. Staple foods found throughout Tanzania include ugali (maizemeal), chapati (thick naan-like bread), kichumbari (tomato, cucumber, bell pepper salad), nyamachoma (barbecued meat- goat, chicken, beef) and mchicha (green vegetable stew). Dishes specific to Northern Tanzania include ndizinyama (banana beef stew) and mahindimaharage (maize and bean stew). If you would like to try local Tanzania food, let us know prior to your climb or safari and we’ll include some local dishes on your menu. 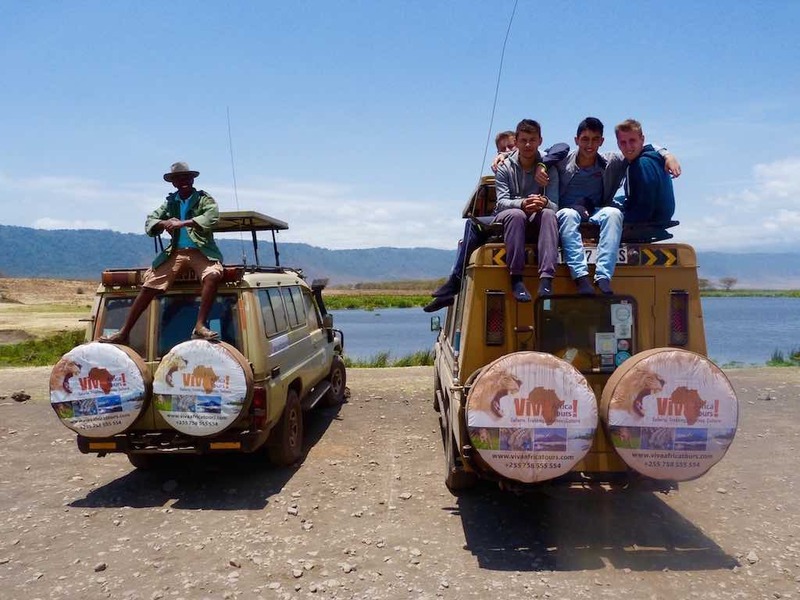 Q: Do you offer join group safaris? 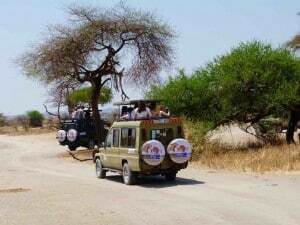 A: Yes, we offer many routes and dates for group safaris. Group safaris are great if you’re a group of friends or family (obviously) but they’re even better if you’re a solo traveller and you’d like all the fun and awe of a safari but you don’t want to go it alone. It’s cheaper for you, too. Group safaris can be magical. At the beginning of the tour, you’re a group of like-minded strangers but through your amazing safari experiences you’ll be best of friends by the end. Many people have made lifelong friends through our group safaris, and visit us again the next year! Q: What are Viva Africa Tours' safari vehicles like? Our safari vehicles are 4x4 Toyota Land Cruisers with an open roof, which is perfect for wildlife viewing. The seats have been adapted to full-size seats to make the time you’re sitting down comfortable. Q: What are the road conditions in Tanzania? Roads between towns and the national parks of the Northern Safari Circuit are generally well-maintained and a comfortable ride (except for the road to the Serengeti). Inside the national parks all roads are pretty rough and not maintained so well. They become muddy during the rainy season and dusty during the dry season. But you didn’t come here for the fast roads! Q: Will I be able to charge my electronic devices on safari? Most lodges have outlets so you will be able to recharge batteries. However, because the lodges are run on generators, the electrical current is not as strong as traditional electrical currents, and some lodges turn off their generators at midnight. Keep in mind Tanzania uses 220v electricity and you’ll need to bring the right converters and adaptors (Type D & Type G). Some of the campsites offer outlets in the dining area. Campsite etiquette dictates a first- come-first-servedprinciple. Our safarti trucks have charging ports that you can use when you’re on the move. Q: How much shall I tip the crew? Q: What are the Big Five? The Big Five are the rhino, elephant, lion, leopard and buffalo. The Big Five is a term that originated with hunters who hunted game. The Big Five were the most difficult to hunt and at that time it was believed that the Big Five hunted people. These days the Big Five is just a marketing term used by safari companies. Tanzania is home to the Big Five but it’s also home to so much more than that - from the smallest Kilimanjaro mouse shrew to the biggest bull elephant, Tanzania’s native fauna is something to get excited about and be proud of. We’re hoping that our guests are happy to enjoy the full range of the beautiful creatures that live here, and not be hung up on the Big Five at the expense of other animals. But on safari with us there is a good chance that you’ll meet the Big Five up close and in the wild. Q: What is the Great Migration? A: The Great Migration is the annual movement of 1.2 million wildebeest and zebra between Tanzania’s Serengeti National Park and Kenya’s Maasai Mara. Q: What is a game walk? A: A game walk is a walking safari inside or near a national park. You’ll enjoy a stroll or hike surrounded by the wildlife, but, don’t worry, you’ll be escorted by a professionally-trained armed guard with radio. We recommend a walking safari at the quieter Arusha National Park.